Kids are amazing. The stuff that comes out of their minds is so free form and astonishing sometimes. I recently got a drawing from a girl I teach at Karate Job of a T-rex on a blimp. That’s right: a dinosaur riding on a blimp, which also had teeth and eyes, and fire coming out the back of it. I pointed out the amazing art of David Devries, who turned children’s drawings of nightmares into horrible, incredible works of art. 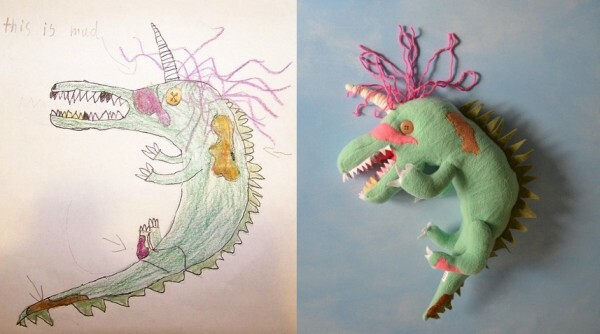 Now there’s a company doing something similar, but far more friendly (and profitable, I hope): they’re taking children’s drawings and turning them into toys. What a fantastic idea! It also serves as a reminder of the kind of nightmare fuel that kids think of all my themselves. Creepy and awesome.